WHO Guidelines on Hand Hygiene in Health Care: First Global Patient Safety Challenge Clean Care Is Safer Care. Geneva: World Health Organization; 2009.
WHO Guidelines on Hand Hygiene in Health Care: First Global Patient Safety Challenge Clean Care Is Safer Care. Geneva: World Health Organization; 2009. Hand hygiene is a crucial action recommended for preventing and controlling the transmission of pathogens within healthcare settings to ensure that patients remain safe and that their risks of acquiring infection are minimized. Hand hygiene is an essential practice for all health-care workers (physicians/doctors, midwives, nurses, pharmacists, dentists, and other care providers including community health workers and family members) in order to protect the patients and themselves. Handrubbing is the gold standard technique to perform hand hygiene on all occasions except for those described for handwashing with soap and water, i.e. handrubbing is the action recommended for health-care workers for the routine, day-to-day decontamination of hands. Handwashing still occupies a central place in hand hygiene and should be employed when hands are visibly dirty or visibly soiled with blood or other body fluids; after using the toilet; and when exposure to potential spore-forming pathogens is strongly suspected or proven, including during outbreaks of diarrhoea. Understanding and employing the correct method and technique at the correct moment is highly likely to result in optimum compliance with hand hygiene and maximum safety of patients and staff. The advantages and disadvantages of both alcohol-based handrubs and handwashing with soap and water can be found throughout the WHO Guidelines on Hand Hygiene in Health Care. 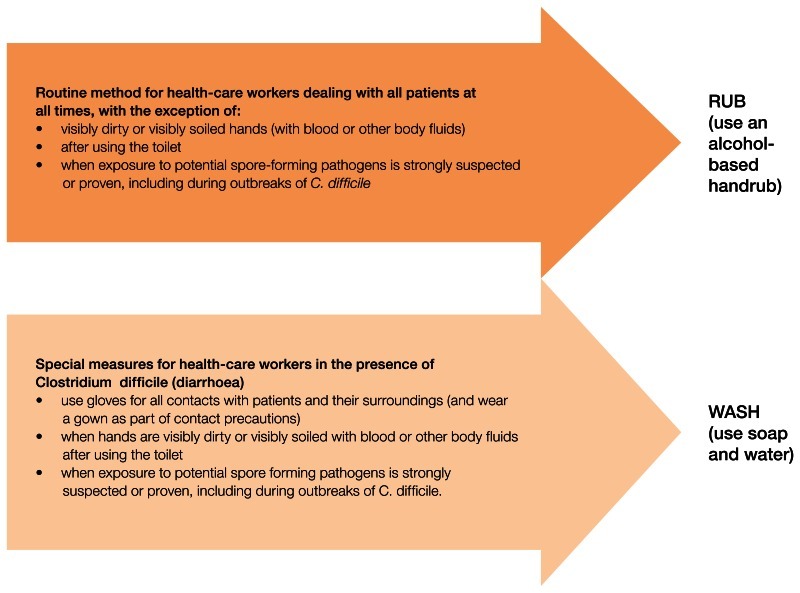 The following information is intended to support healthcare workers and others in understanding and explaining the challenges presented by patients with C. difficile infection, particularly in relation to hand hygiene. when exposure to potential spore-forming pathogens is strongly suspected or proven, including during outbreaks of C. difficile. Background information on C. difficile is available from a range of scientific and patient support documents. The following information is an overview of what C. difficile is and the problems it can cause. C. difficile is a bacterium (germ) that is present naturally in the bowel of some individuals. It can spread by touching faecally contaminated surfaces and then touching your mouth, e.g. when eating. It can also spread following contact with the faeces of people who have the infection, if the bacterium is ingested through your mouth. If someone is taking antibiotics to treat an infection, they can kill the good bacteria living in the bowel as well as the bad; when this happens C. difficile can grow quickly in the bowel and produce toxins that lead to disease. C. difficile is passed out in the faeces of people who are infected, including in the form of spores (a hardy form of the bacterium), which can survive for a long time in patient surroundings on any surface, e.g. toilet areas, clothing, sheets, and furniture, if these items are not regularly and appropriately cleansed. It is possible for anyone to spread the infection (to themselves or others) because they have not performed hand hygiene properly or kept patient surroundings clean. Elderly people and patients with comorbidities or who have had certain medical procedures to the bowel are especially at risk of getting C. difficile infection. Why have there been increasing numbers of cases in certain countries recently? This is not entirely clear, though it is known that a number of factors may be responsible, including natural changes to the way in which bacteria act in relation to their circumstances; for example, C. difficile becoming more resistant to antibiotics in response to their increased and more widespread use. The growing numbers of elderly, sick patients receiving care, the pressures on health-care workers to deliver care, and the way in which services such as cleaning are provided to health-care settings may all have had an impact. New strains of C. difficile have evolved in recent years that appear to spread more readily and may cause more severe cases of illness. It is also possible that the recommended practices for preventing and controlling C. difficile are not always applied for a number of reasons and may, as a result, be contributing to the current problem. Finally, in some countries where there has been no surveillance of C. difficile until now, reports of rising numbers may be explained because they are now looking for it. Can appropriate infection control practices help prevent and control Clostridium difficile? Yes, they can. It is recommended that gloves be worn (together with gown and application of other contact precautions) and hands washed appropriately if exposure to potential sporeforming pathogens is strongly suspected or proven, including C. difficile outbreaks. The method of hand hygiene to be employed must be handwashing using soap and water. Even when gloves have been worn, handwashing is essential. Of note, it is important that the correct technique for handwashing is applied. In all other health-care situations, alcohol-based handrubs remain the preferred method for hand hygiene and the most reliable method to ensure maximum compliance and efficacy to reduce health care-associated infections and cross-transmission of pathogens. What is the concern about health-care workers using alcohol-based handrubs at the point of care when patients have Clostridium difficile? There is concern because alcohol-based handrubs are known to be less effective on soiled hands generally and, specifically, when there is C. difficile infection. This is because of the handrubs’ inability to kill the C. difficile spores that at times can be present. Conveying simple messages to health-care workers, through routine training and updates, and reinforcing these during times of outbreaks will help to ensure that the correct methods for hand hygiene are applied at the correct moments. To sum up, these messages are repeated in the diagram. Should we remove alcohol-based handrubs from areas where there is Clostridium difficile infection? They are easy to use and therefore more likely to result in greater compliance with the need for hand hygiene by health-care workers. They are proven to be effective in killing a range of pathogens and therefore reducing patients’ risk of acquiring health care-associated infection. They are effective in killing the non-spore form of C. difficile which may be present in higher numbers than the spores. Sinks for handwashing are not always readily available and, even if they were made available right next to a patient, washing takes at least twice as much time than rubbing – all factors that mitigate against full compliance with hand hygiene. Relying on promoting handwashing only in health care is thought to result in lower compliance, lower efficacy and greater risk of continued spread of pathogens. Evidence-based research reinforces the need for the presence of alcohol-based handrubs to ensure maximum patient safety. There is no evidence to suggest that their use has been connected with increased C. difficile infections. Thus, alcohol-based handrubs should NOT be removed from health-care settings; to remove them would be likely to result in greater risk to patients from health care-associated infections. Are visibly clean (not soiled) hands still at risk for cross-transmission? It is very unlikely. Because handwashing with soap and water is recommended when exposure to potential spore-forming pathogens is strongly suspected or proven (this includes outbreaks of C. difficile), it is very unlikely that using alcohol-based handrubs on visibly clean hands will put patients at risk of cross-infection. In fact alcohol-based handrubs are effective in killing the non-spore form of C. difficile that can also be present. Therefore, appopriate glove use and adopting either means of performing hand hygiene on non-soiled hands will ensure clean, safe hands. The bottom line is to remember the message that hands should be washed thoroughly with soap and water when they are visibly dirty or visibly soiled with blood or other body fluids. How often will the spores be present when patients have Clostridium difficile infection? When patients with C .difficile have severe diarrhoea, large amounts of spores can be present. This is the basis of all the recommendations featured here. This is also true of specific strains of C. difficile, including those that are epidemic in certain countries. Effective hand hygiene at the point of care, together with other well-accepted control measures (in particular, glove use and gowning as part of contact precautions, and individual rooms), helps to manage the problem. Clostridium difficile figures are very high is some countries, and seem to have become worse. Is this because of alcohol-based handrubs? There is published evidence that the extensive use of alcohol-based handrubs in hospitals has not led to an increase in C. difficile. Does the promotion of alcohol-based handrubs imply the “downgrading” of sinks and handwashing? No. Guidance usually highlights the fact that handwashing is essential in specific situations (as described above). Although washing hands with soap and water remains an accepted method for routine hand antisepsis, alcohol-based handrubs should be promoted as the gold standard for hand hygiene considering, in particular, their dramatic impact on improving compliance with hand hygiene and ensuring clean, safe hands. What other key measures should be taken to prevent and control Clostridium difficile? There are several measures, including performing hand hygiene, that should be applied to prevent and control C. difficile infection, and these have been published widely. The following is a brief description of these key steps, which should be in place when C. difficile infection is present. Antimicrobial prescribing is a crucial part of preventing, controlling and managing C. difficile infection. Guidance is widely available on this. Antibiotic stewardship is therefore an important part of health-care services to control C. difficile, as is the appropriate prescribing of other drugs including antacids and perhaps proton pump inhibitors. Patients with, or strongly suspected of having, C. difficile infection should be cared for in a single room with a toilet or dedicated commode and other dedicated care equipment until they are symptom-free for at least 48 hours. If single rooms are not available, cohorting of patients with C. difficile infection should be considered in conjunction with risk assessment and infection control expertise. Patients with C. difficile infection should have their surroundings and other areas of concern, e.g. toilet areas, cleaned at least daily using clean equipment and a freshly-made solution containing at least 1000 ppm available chlorine (this can be done by cleaning areas as normal and then using a “bleach” to clean afterwards or by using a combined detergent and chlorine-based solution). It should be noted that non-chlorine-based cleaning agents can promote the formation of C. difficile spores. Air drying should be allowed following cleaning. Health-care workers should wear gloves and aprons when providing care for patients with C. difficile and should discard them immediately after they have been worn for a patient-care activity. Hand hygiene must then be performed. There is evidence that wearing gloves significantly reduces C. difficile infection and is therefore crucial, even though handwashing reduces spores and alcohol-based handrubs are effective against non-spore forms of C. difficile. keep clean the machines or sink areas where laundry has been washed. surveillance and education programmes, with multidisciplinary teams working to ensure targeted management and control. Preventing and controlling the spread of all diarrhoeal diseases is important. The main message is that hands should be washed thoroughly with soap and water when they are: visibly dirty or visibly soiled with blood or other body fluids; after using the toilet; or when exposure to potential spore-forming pathogens is strongly suspected or proven, including during outbreaks of C. difficile. Performing hand hygiene using an alcohol-based handrub is the recommended and most effective method to clean hands in most patient-care situations. According to recent evidence, alcohol-based handrubs have been a major factor in the reduction of serious infections such as MRSA, for example in the United Kingdom. It is important that the correct technique for hand hygiene is always applied. Copyright © 2009, World Health Organization. All rights reserved. Publications of the World Health Organization can be obtained from WHO Press, World Health Organization, 20 Avenue Appia, 1211 Geneva 27, Switzerland (tel. : +41 22 791 3264; fax: +41 22 791 4857; e-mail: tni.ohw@sredrokoob). Requests for permission to reproduce or translate WHO publications – whether for sale or for noncommercial distribution – should be addressed to WHO Press, at the above address (fax: +41 22 791 4806; e-mail: tni.ohw@snoissimrep). WHO Guidelines on Hand Hygiene in Health Care: First Global Patient Safety Challenge Clean Care Is Safer Care. Geneva: World Health Organization; 2009. Appendix 2, Guide to appropriate hand hygiene in connection with Clostridium difficile spread.